Stream anime episodes for free, you want to Watch Fairy Tail Episode 23 English Subbed online for free. Episode guide Fairy Tail Episode 23 English Subbed 15 Minutes While Fairy Tail heals its wounds, Phantom Lord appears in Magnolia. 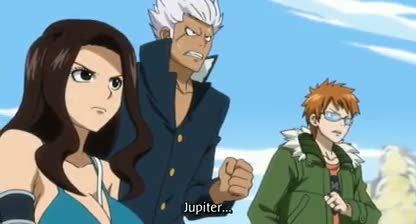 Erza is defeated by one of the most powerful magic force – the magic cannon Jupiter. Determined to take back Lucy and what he believes is an endless source of wealth, Jose threatens Magnolia with the Jupiter cannon, but Fairy Tail refuses to hand her over without a fight. With only fifteen minutes before the cannon fires again and none of their strongest mages available to defend them, Fairy Tail struggles to fight back as Natsu rushes to destroy Phantom Lord’s cannon.